A place of great beauty and high contrasts, Mkhuze is renowned as a mecca for bird lovers, with more than 420 bird species on record. 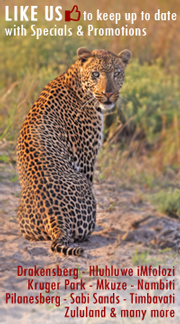 The reserve has an astonishing diversity of natural habitats, from the eastern slopes of the Lebombo mountains along its eastern boundary, to broad stretches of acacia savannah, swamps and a variety of woodlands and riverine forest. 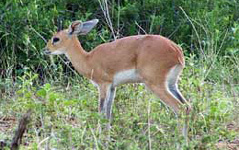 Mkhuze Game Reserve constitutes the north western spur of the Greater St Lucia Wetland Park a recently declared World Heritage Site. The Mkhuze River curves along the reserve's northern and eastern borders with a fine stretch of fig forest along its banks. Fish eagles swoop over the pans, snatching prey spotted from their perches in the fever trees. Other animals to be found in the reserve include black and white rhinoceros, elephant, giraffe, leopard, buffalo, nyala, blue wildebeest, warthog, impala, kudu and other smaller antelope. Rare species occurring are cheetah, hyaena and suni. 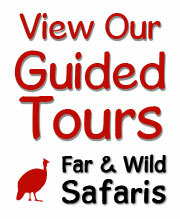 Visitors enjoy excellent animal and bird sightings from the three hides in the reserve. A Zulu cultural village in the reserve offers a glimpse of the traditional lifestyle and crafts of the KwaJobe community. Nature lovers visiting Mkhuze have a range of accommodation facilities available to them. 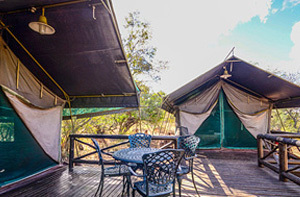 Not least among these is the self-catering Tented Safari Camp. 10 x 2 bed and 3 x 4 bed tented units. Each has en-suite ablution facilities (including hot and cold showers) and its own open plan kitchen. With refrigeration and electricity available, this camp is ingeniously designed to blend into its natural setting. 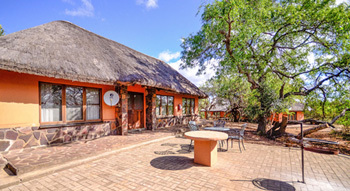 Nhlonhlela Bush Lodge is an eight-bed lodge overlooking Nhlonhlela Pan. All units are en suite and are connected by boardwalks branching out from the communal lounge and kitchen. A cook/caretaker is in attendance, as well as a field ranger to take visitors on game walks. Nature lovers visiting Mkhuze have a range of accommodation facilities available to them. 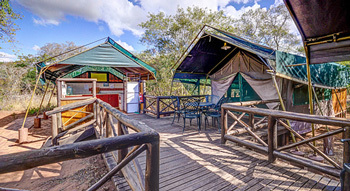 Not least among these is the self-catering Tented Safari Camp. This has ten 2 bed and three 4 bed tented units. Each has en-suite ablution facilities (including hot and cold showers) and its own open plan kitchen. With refrigeration and electricity available, this camp is ingeniously designed to blend into its natural setting. It offers close by amenities such as a swimming pool (an essential comfort during the hottest months of summer), a small restaurant with limited seating and take-aways and a curio shop. The shop combines with the camp office, stocking curios, clothing, basic food supplies and liquid refreshments. Emshopi Camping and Caravanning area is situated 1 km from the main gate, and 9 km from Mantuma Camp. It can accommodate sixty visitors, and is situated at the entrance gate. Ablution blocks with hot and cold water serve the campsites. 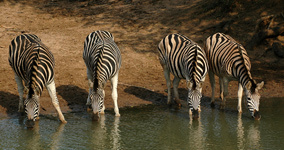 Nhlonhlela Bush Lodge is an eight-bed lodge overlooking Nhlonhlela Pan. All units are en suite and are connected by boardwalks branching out from the communal lounge and kitchen. A cook/caretaker is in attendance, as well as a field ranger to take visitors on game walks. The lodge is served by solar powered lighting. Good torches and a gas light are recommended. There is an educational camp which consists of 4 dormatories that sleep 8 each,a kitchen and an ablution block. The reserve has 100 km of tourist roads for game drives.Picnic sites are situated at Nsumo Pan, Nxwala game viewing hide and next to the reception area in the main camp.Short day walks and night drives conducted by a field ranger can be arranged with the Camp Manager the previous day. Birding, game viewing and sitting quietly in the three game viewing hides are the most popular activities in Mkhuze. 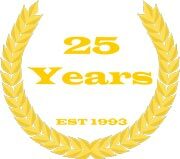 Night drives, guided walks, the auto trail, camping, caravanning and swimming are also available. 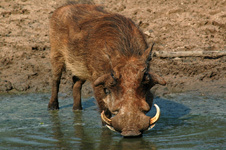 The reserve has 100 kilometers of tourist roads for game viewing. Guided night drives are undertaken weather permitting. Guided game walks can be booked at the camp office and these take place twice daily starting at 06h00 in summer, and 15h00 in winter. Birding in Mkhuze offers some of the best birding opportunities in South Africa and with a bird list of 420 species is excellent all year round. Guided birding walks may be booked at the camp office, and these take place twice daily starting at 06h00 in summer, and 15h00 in winter. A guided Fig Forest walk is also available and is an excellent birding oportunity. Checklists are available from the curio shop. Mkhuze is a place of great beauty and high contrasts and is renowned as a mecca for bird watchers with a bird list well in excess of four hundred. Predominantly flat and dry, with sandy ridges which are ancient dunes, it harbours an astonishing diversity of natural habitats. These range from the eastern slopes of the Lebombo mountains which lie along its western boundry, to broad stretches of gently rolling acacia savannah, swamps and a variety of woodlands and riverine forest. Visitors park their cars and enter the hides on foot. 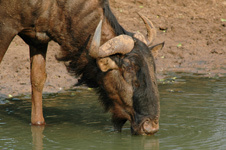 Depending on the surface water in the reserve, but normally during the drier winter months, large concentrations of game may be seen at the waterholes. Visitors larger mammals, these hides offer unique opportunities to photographers and many famous wildlife pictures have been taken there.